Not to be confused with Mad-Bomber. A Madbomber in Wario Blast: Featuring Bomberman! The Madbombers have the same starting abilities as Bomberman and Wario. They can lay bombs and collect and utilize the same powerups. Upon completion of the Normal Zone, the Madbombers gain the same Kicks ability, however, they do not obtain any of the other special items that the player gets upon completion of later rounds. There is always a single Madbomber to face in the first stage of each round, with one more added for each additional stage. In the fourth stage, the three Madbombers unite to form the boss of the round. They display minor differences from Bomberman in the sprites, such as one having a visor, and another having a striped helmet. The Wario enemies display no differences from Wario aside from Palette. 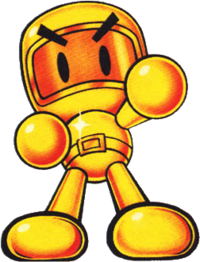 In the original Bomberman GB, the group of Bombermen mugged Bomberman, so he had to fight them in order to retrieve his belongings. ↑ Wario Blast: Featuring Bomberman! instruction booklet, page 4. ↑ Wario Blast: Featuring Bomberman! instruction booklet, pages 5, 7 & 13. ↑ Bomberman GB instruction booklet, page 4. This page was last edited on April 10, 2019, at 19:47.